Description: Just arrived from Juniata shops is the 766, 765, and 767. Description: A short train of rerailed cars from a derailment up on the Marsh Fork Subdivision crosses the bridge over the Clear Fork at Jarrolds Valley, WV. 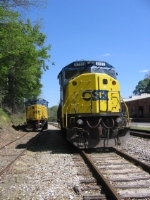 Description: A CSX "extra" train comes into Tuscaloosa, heading west to Artesia, Mississippi. This train appeared the day after a recent M&B derailment near Selma, Ala. Description: A recent westbound CSX "extra" train comes into Tuscaloosa on the old GMO Warrior Branch where the ABS RR recently had a bad fire. This train showed up the day after another M&B derailment near Selma, Ala.